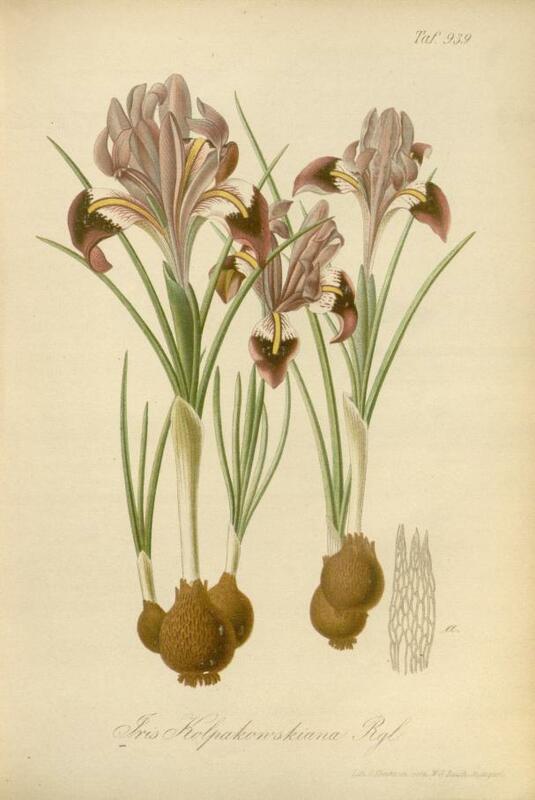 As reported in "Iris(Xiphion) Kolpakowskyana.— In the autumn Dr. Regel kindly sent me a couple of bulbs of this beautiful species, which is, I believe, a native of Turkestan. They were crushed nearly flat in the pot, and I had but little hope that they would live. Since bulbs of Crocus alatavicus which accompanied them were hopelessly smashed. I planted the Iris in prepared charcoal, a wonderful restorative for injured or diseased bulbs, and one has recovered sufficiently to flower. It is a very distinct and lovely species, and a meet companion for its beautiful sisters Histrio and reticulatum. The leaves, as far a; I can see, are two or three in number, short, obovate lanceolate. Stem little or none. Limb pale lilac shaded with white. Falls obovate, tapering to a sharp point, at the base pure white, tips bright lilac ; keel bright yellow feathered with purple towards the base. Standards and claws pale lilac minutely freckled with white, giving the appearance of reticulation. Bulb somewhit resembling X. reticulatum. I flowered it in a pit in a cold frame. H. Harpuir-Crewe, Drayton-Beauchamp Rectory, Tring, January 17. Rootstock , an ovate bulb, covered with a network of fibres, similar to those of I. reticulata, but if anything coarser. Leaves , 3-4 are produced from each bulb, all enclosed in one membranous sheath, 2 in. 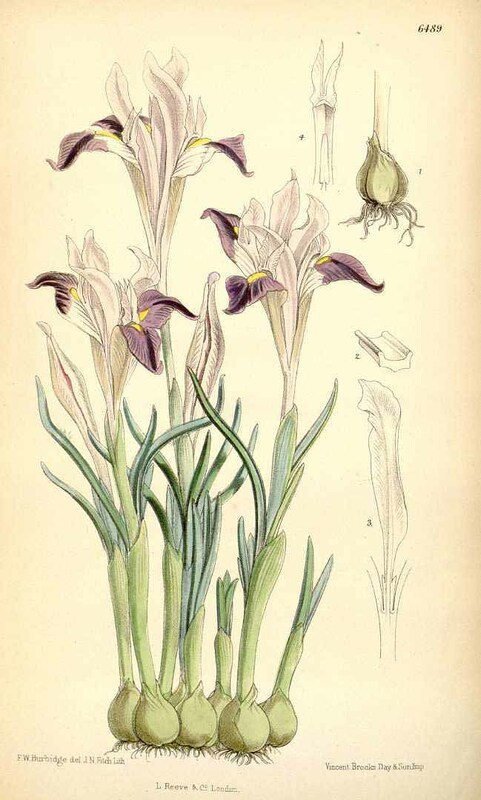 long at flowering time, channelled with thick edges, linear, resembling those of some Crocuses. Spathe valves , distinctly green, acuminate. Falls : under surface, greenish yellow with purple shining through. Upper surface. The lanceolate blade is tipped with fine red purple with a few darker veins. Below this purple region the ground is of a creamy white colour on either side of the low yellow crest. On the haft the crest diverges into two yellow bands, which become greenish at the base and the ground is marked with dotted purplish veins. Standards , concolour, oblong, of a very light purple. Styles , concolour, very light purple. This species is no longer apparently in cultivation in England and from the fact that it has more than once died out it would seem to be somewhat difficult to manage. 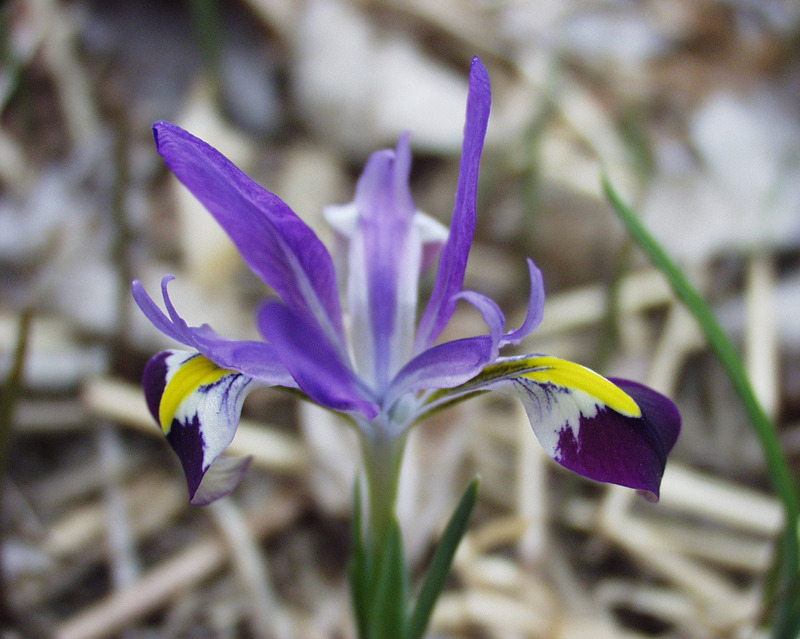 Its Crocus-like foliage at once distinguishes it from all other Irises but its position in the Genus is uncertain.